"It makes you feel alone, you know, hurting somebody." In a year filled with the fun of wizards and pirates, Clint Eastwood released an ominous adaptation of Dennis Lehane's best selling novel, Mystic River. For several decades Eastwood has been a superstar on the screen, but for the past 20 years he has also shown that he is a major talent behind the camera. Like many of his prior directing projects, Mystic River is a film of great sorrow about the effect of violence on people. There is a profundity to the simplicity of the filmmaking present here that allows the ensemble cast, as well as Brian Helgeland's script, to soar. As the story begins, three boys are playing street hockey on a Boston street during the 1970s. When their ball falls into the sewer, Jimmy Markum, Sean Devine, and Dave Boyle entertain themselves by writing their names in the cement until a man, carrying handcuffs, approaches them. All three boys assume the man to be a cop, but in fact he is a much more intimidating figure. In a fateful moment on an ordinary day, Dave enters into the man's car and never sees the light of day through the same eyes again. The scene permeates throughout the rest of the film; not because of what it shows, but because of what it doesn't show. Eastwood's direction of this scene sets the stage for the film. Watching Mystic River is like seeing an unspeakable evil approaching and then spending the next two hours learning the full consequence of this evil. The script moves into the present day, with each of the three boys now leading lives of complexity. Jimmy (Sean Penn) is an ex-con who is remarried with three daughters. His oldest daughter, Katie (Emmy Rossum), has plans to run off to Las Vegas with her boyfriend, Brendan Harris (Thomas Guiry). These plans are a secret, since Jimmy despises the entire Harris family for reasons that are not entirely revealed. The night prior to her departure and sister's first communion, Katie goes out to a bar with her friends. The three girls catch the eye of Dave (now played by Tim Robbins), who now lives a life of lies and despair. Later that same night, Dave returns home to his wife, Celeste (Marcia Gay Harden), with blood on his hands. He tells her a story about a mugger attacking him and that he might have killed the man. Yet when the sun rises the next day there are no dead men found. Instead Katie's car is found with blood in it. Sean (Kevin Bacon) is now a homicide detective working with his partner and friend, Sgt. Whitey Powers (Laurence Fishburne), after his wife left him, with their baby girl, six months ago. Sean and Whitey are called into investigate at the same time that Katie is a no-show at her sister's first communion, which prompts Jimmy to investigate as to the whereabouts of his daughter. In a cataclysmic scene, Jimmy learns of his daughter's murder. Sean Penn has made a career for himself of playing intense parts, but there are few, if any, that he has acted with more grace and vigor than this one. The rest of the film becomes a taut investigation, but not of Katie's murder. Rather, Eastwood and Helgeland are engrossed in exploring the nature of violence and what it does to the men and women it surrounds. As the story unfolds, we learn piece-by-piece what happened to each character between the opening scene and the killing. The murder is the centerpiece of the story, but only as a plot device. The identity of the killer is important, but only in a secondary manner. The interactions of the characters, especially between the three leading men and their wives, are the heart of the story. Not much attention will be paid to Marcia Gay Harden and Laura Linney (the latter of whom plays Jimmy's wife, Annabeth), yet they're roles are instrumental in understanding Dave and Jimmy. Each actor delivers a fine performance. Sean Penn is not a diverse actor, but when it comes to playing straight drama he is one of the best. As Jimmy Markum, Penn displays a great deal of restraint and emotion that could easily be outside of another actor's reach. Equally impressive are Tim Robbins and Marcia Gay Harden, who have a strong chemistry together. The famous "Vampire Scene" between the two of them is a showstopper, with Robbins tapping into a part of himself that has never been seen on film before. Kevin Bacon's performance, although it contains no speeches or moments of anguish, is the best of the entire group. Bacon manages to pull off one of the most difficult roles for an actor: playing a man who never expresses his emotion or opinion. Bacon perfectly captures the behavior of a detective, keeping Sean distant from the rest of the characters and turning him into an observer with whom the audience can find their niche. Rounding out the ensemble are fine supporting performances by Fishburne and Linney, as well as impressive work by newcomer Thomas Guiry as Brendan. Mystic River feels like an old-fashioned movie that depends entirely on the cast and script. Helgeland's script is one of the more impressive bits of screenwriting from the past few years, with realistic dialogue that adds to the authenticity of the film. Complimenting the script is Eastwood and his crew's craftsmanship and artistry. Everything plays like a well-oiled machine, from the cinematography by Tom Stern to the editing by Joel Cox. Eastwood is in complete control of his art, both as a director and as the film's composer, and trusts his cast and crew enough that he has anchored a modern urban drama that pushes, without preaching, its audience to ponder the nature of violence in our society. Image Transfer Review: Mystic River is presented in its original aspect ratio of 2.35:1. This anamorphic RSDL transfer is flawless, with not a single print defect or any traces of mosquito noise or grain. The colors are strong and detail is amazing strong, which helps in presenting the authentic Boston locations. Skin tones are accurate and there is a tremendous amount of depth in the image, creating a film-like look. Contrast is strong with rock solid blacks that look amazing in the climax and when Dave tells his son a bedtime story. This is a reference quality transfer. Audio Transfer Review: Alongside the transfer is an extraordinary Dolby Digital 5.1 mix. Clint Eastwood's score sounds nice and soothing in the speakers, especially in the surrounds. There are more dynamic audio mixes on DVD, but the sound separation and directionality here helps draw the viewer into the film. Ambience, particularly in the cellar scene near the beginning, creates an eerie experience. Dialogue sounds crisp and is always audible. The surround speakers do not get a tremendous work out, but are used well for crowd scenes and the scene when Katie's body is found. Presented in both English and French, this sound mix is an accurate staging of Mystic River's theatrical experience. The Charlie Rose Show Interviews—interviews by Charlie Rose of Clint Eastwood, Tim Robbins, and Kevin Bacon. Soundtrack CD—the complete original score presented on a CD containing 19 tracks. Extras Review: Those who spring for the three-disc edition will get a nice collection of extras. Disc 1 contains a feature length commentary by stars Tim Robbins and Kevin Bacon. The two men speak about how they came into contact with the script and give a lot of anecdotes about working with Eastwood. Robbins spends a lot of time talking about the benefits of working only eight-hour days, but eventually the praises of Eastwood become tiring. Unlike most commentaries with actors, however, this one does have many valuable insights about how the actors approached the role and their designs with particular scenes. Disc 2 plays host to supplemental features about the making of the film. Mystic River: Beneath the Surface (22m:50s) has interviews with Eastwood and the cast, as well as Dennis Lehane and Brian Helgeland. The documentary is in anamorphic 1.78:1 widescreen, with Dolby Stereo 2.0 sound. It tells the backstory of the film, such as Lehane's reluctance to have the book made into a film until Eastwood approached him. There are also some interesting bits of information from the actors, especially Laura Linney, about the tactics they used while acting their scenes. This is a very pleasant documentary to watch and should not be mistaken as just a promotional piece for the film. The featurette Mystic River: From Page to Screen (11m:30s), however, does play like a publicity tool, but an above average one. The same interviews shown in the documentary are seen here, with only a few bits of new information. It would have been nice if the featurette was dedicated entirely to the people involved with adapting the book instead of having superfluous comments from the cast. Also on Disc 2 are interviews from The Charlie Rose Show. Clint Eastwood (41m:50s), Tim Robbins (50m:24s), and Kevin Bacon (19m:03s) each grant an interview that can either be viewed on its own or with the others via a play all function. These aren't the most engaging of interviews, but definitely are better than the usual late night TV show interview. Bacon's is the one that most centers itself around Mystic River, while Robbins delves into politics and Rose probes Eastwood about his illustrious career in the other interviews. The theatrical trailer (02m:20s) and teaser (01m:14s) can also be found on the second disc, in anamorphic widescreen and Dolby Stereo 2.0 sound. The third disc is a soundtrack of the original score. This is not the same as the soundtrack that was released last fall, which contained songs featured in the film. Eastwood's is a very fine score, but the majority of the 19 tracks here are variations of the main theme, with only a few completely different pieces of music. Fans of jazz and the Blues will like this CD; whereas others might find it repetitive. Considering that Eastwood is not big on extra features for inclusion on DVDs of his films, this is a welcome change of pace that fans will appreciate. 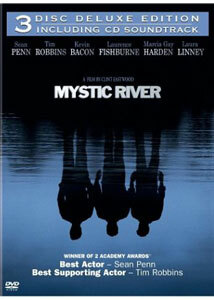 Like Unforgiven and A Perfect World, Mystic River is a mature and insightful film from Clint Eastwood. The strength of the acting and script will remain with you well after the closing credits. This three-disc edition DVD is an outstanding set from Warner Home Video. The transfer and sound mix are fantastic representations of the theatrical experience and the extra features contain informative information that makes this worth its steep retail price.